In technical environment, humans frequently use electronic gadgets like computers, laptops, smart phones and tablets. But, continued use of gadgets can harm the eyes. Strain in the eye is the most common problem and due to this users suffer from computer vision syndrome. 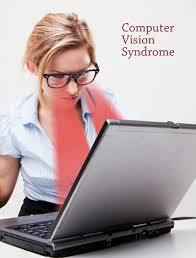 This syndrome is also called Digital Eye Strain. It is often caused by excessive bright light, either from the sunlight coming in through a window or from harsh interior lighting. Presently, in offices, most of the employees use computers to do official work. Working at a computer requires that the eyes constantly focus, move back and forth, and align with what users are seeing. They may have to look down at papers and then back up to type, and the eyes have to accommodate to changing images on the screen in order to create a clear picture for the brain to interpret. These exercises put burden on eye muscles. These symptoms occurs due to poor lighting conditions, glare on the computer screen, improper viewing distance, poor posture for sitting, and often a combination of all these factors.Glare on walls and finished surfaces and reflections on computer screen can be strenuous. Patient history to determine any symptoms the patient is experiencing and the presence of any general health problems, medicines taken, or environmental factors that may be responsible for the symptoms related to computer use. Visual acuity measurements to evaluate the extent to which vision may be affected. A refraction to determine the appropriate lens power needed to compensate for any refractive errors (near-sightedness, farsightedness or astigmatism). Testing how the eyes focus, move and work together. In order to obtain a clear, single image of what is being viewed, the eyes must effectively change focus, move and work in unison. This test will highlight problems that keep user’s eyes from focusing effectively or make it difficult to use both eyes together. Initially, computers were used almost exclusively by adults. But gradually technology was accessible to children also. All over the world, children use computers for most of the daily activities, both for education and recreation. Children can experience similar symptoms related to computer use as adults. An eye examination: Parents are advised to make sure that the child can see clearly and comfortably. It is better go for child’s thorough eye test. For regular computer users, at least an annual eye examination is necessary. When required, refractive correction exercisesshould be provided. Parents must monitor that child should not use computer for longer duration. There must be a ten minutes break for every hour work. It will minimize the development of accommodative problems and eye frustration. Parents or guardians must carefully check the position of the computer. 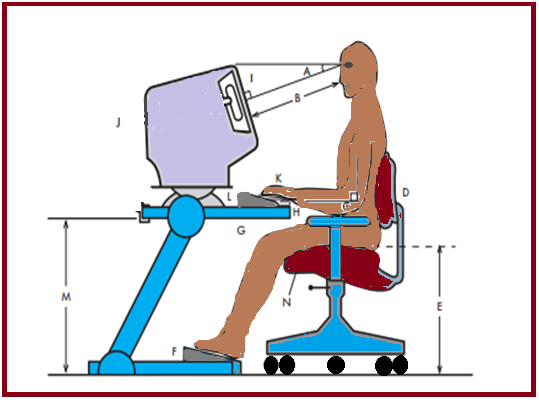 The computer monitor and the keyboard are positioned and adjusted according to child's body parameters. The screen should not be placed in a too high level in the child's field of view; the chair should not be put in too low level and the desk not in a too high level. An adjustable chair can be bought for children. A foot stool may be necessary to support the child's feet. It is necessary that workstation design should be perfect. The main components of a computer workstation are the desk or display support, support for keyboard and mouse or other input device and the chair. A workstation should allow the users to espouse a healthy, comfortable posture without overloading the musculo-skeletal system. Therefore, the furniture should be adjustable as far as practicable. Other requirements include sufficient space on work surfaces for documents and sufficient leg room. It is highly important to carefully check the lighting for glare on the computer screen. Windows or other light sources could create glare on the screen. When this happens, the desk or the computer screen should be turned to another direction. Lessen the amount of lighting in the room. Specialists advice that computer users can use a dimmer light instead of the bright overhead light especially for children. Children have different requirementsfor comfortable use a computer. It is important that elders must take for precautions to help the appropriate viewing habits and guaranteethat children can use computer in comfortable position and enjoy this advanced technology. It is recommended to replace old CRT monitor with a flat-panel liquid crystal display or an anti-reflection screen. Computer users must adjust the display settings of computer to diminish eye strain and fatigue. Keep computer at a distance of 20-26 inches from eyes. Ensure the centre of monitor is 4-9 inches below the eye level. Adjust the brightness and contrast of the display, so that it is almost the same as the brightness of surrounding workstation. Adjust the text size and contrast for comfort, particularly when reading or composing long documents. Usually, in order to reduce strain, black print on a white background is the best combination. It is also important to reduce the colour temperature of display as it lowers the amount of blue light emitted by a colour display for better long-term viewing comfort. When users are working on a desktop, it is necessary that the keyboard and the mouse are below elbow level. One may also use keyboard extension board for a more comfortable typing experience. The wrist should not bend while typing.While sitting on the chair, user's feet should be firmly fixed to the ground and knees should be at a right angle or more. Keep back and shoulders straight. User’s arms should be parallel to the floor while typing. To avoid strain while working for longer period, users must look away from computer at least every 20 minutes and gaze at a distant object (at least 20 ft away) for a minimum of 20 seconds. This is known as20-20-20 rule. Users can also look at a distant object for 10-15 seconds, then gaze at something up close for 10-15 seconds and then again look at the distant object. They must perform this activity for 10 times. Corporate executives have to devote longer period to complete their projects. To reduce strain, they can opt for customised computer glasses, also called anti-reflective coating screen or glasses. This is especially helpful if users normally wear contact lenses, which may become dry and uncomfortable during sustained work. Computer glasses are also good if people wear bifocals or progressive lenses. It is also suggested that users must blink their eyes frequently to avoid the problem of dry eyes. They can also use lubricating eye drops as per doctor’s advice. If the problem still persists then it is the time to seek advice from an ophthalmologist.